I took this data from Bortle 0 skies outside of Ft. Davis TX. I had planned many different objects to image on my two night stay, but cloudy skies limited me to 3hrs of sky, barely enough to capture this object. Even still, the amount of dust and stars in the background is extremely impressive. 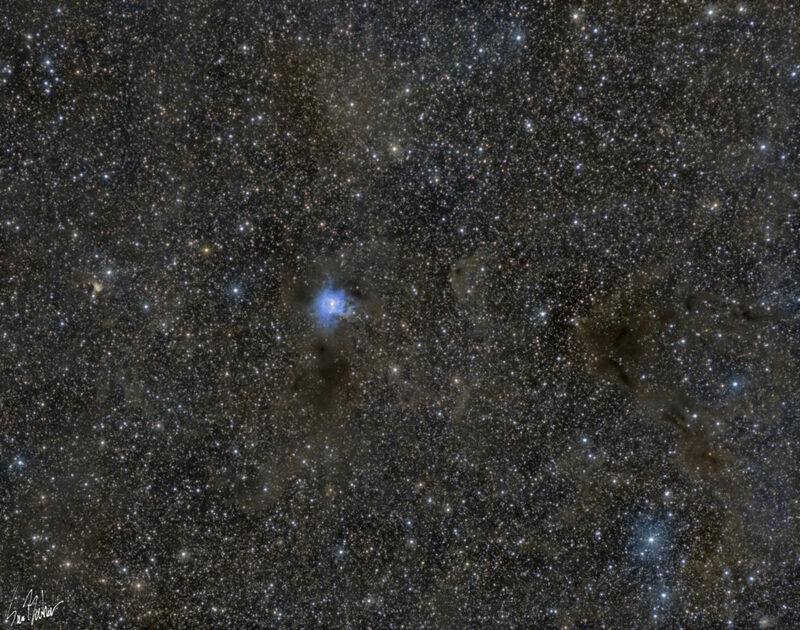 The Iris nebula (NGC 7023, center) is named for the blue reflection nebulosity at it’s center, resembling an Iris (the flower). The Ghost nebula (vdb 141, left of center) casts a golden light on the surrounding dust (which, when magnified, resembles ghosts). LBN 468 (the dark mass on the right side) is a huge complex of cool gas and dust absorbing light from the surrounding stars and slowly forming stars as it condenses. If one zooms WAY into the bottom right corner, the barred spiral galaxy NGC 6951 can be seen peeking through the dust.